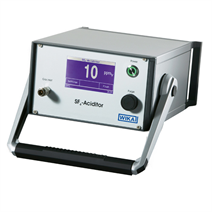 The model GA25 analysis instrument is a cost-effective solution for determining the concentration of SO2 in SF6 gas-filled equipment. The concentration of SO2 is an indicator for the presence of decomposition products in SF6 gas. The advantage of the GA25 over conventional single-use test-tubes lies in the reproducibility of the measured value and the simple operation. The electrochemical sensor can, after a service life of 24 months, be replaced by the operator. The GA25 was developed for the fast and accurate measurement of SO2 (Sulphur Dioxide). With its automatic pressure and flow control, the measurement is reproducible and erroneous measurement is thus eliminated. During the measurement, the determined concentration can be read directly from the touchscreen. The test gas can be temporarily collected at the outlet of the GA25 with a gas-recovery bag so that the environmentally hazardous SF6 gas does not escape into the surrounding atmosphere.